This autumn's battle for Congress has already started, and the bayonets are pointed with specific venom at Speaker of the House Nancy Pelosi. Two Republicans have teamed up to try and overthrow Pelosi's reign and, according to The Wall Street Journal, have together raked in $1.8 million for their campaigns in California. Republican Dana Walsh alone has raised $1.44 million from individual contributors, which is impressive considering that Pelosi herself has raised just 1.7 million. Walsh received only nine percent of the vote in 2008 – with much less cash – but her chances will improve this year; money has flooded in from outside of San Francisco from people who just plain want Speaker Pelosi deposed. Nancy Pelosi made history in 2007 when she became the first female Speaker of the House of Representatives, putting her second in line to the presidency after Vice President Joe Biden. She is currently the highest ranking female political figure in US history. A self-proclaimed "ardent, practicing Catholic," as she told the International Herald Tribune, her staunch pro-choice advocacy and push to expand human embryonic stem cell research have kept her at odds with the Catholic Church. Ms. Pelosi is a vocal advocate for health care reform, having played a major role in the passage of the recent health care reform bill, and has worked her entire career to legislate stringent environmental accountability, increase free trade and human rights in countries such as China, further gun control in the US, place a moratorium on the death penalty, and pursue fossil fuel alternatives while maintaining current restrictions on offshore drilling. Nancy D'Alesandro graduated from an all-girls' Catholic high school in Baltimore before earning her Bachelor of Arts in Political Science from Washington D.C.'s Trinity College (now Trinity Washington University) in 1962. It was at Trinity that she met her husband, Paul Pelosi, whom she married in 1963. The Pelosis moved to San Francisco in 1969, where Paul's brother Ronald Pelosi held a spot in San Francisco's City and County Board of Supervisors. In 1977, Nancy Pelosi became a Democratic Party chairwoman, and continued to rapidly further her career in politics with a campaign fundraising whirlwind. She first ran for Congress in 1987, when her eldest child was a senior in high school, and has been the Representative of California's Eighth District in Congress since then. The Pelosi family is independently wealthy, mainly through stock and real estate investments, and has five grown children and eight grandchildren. Pelosi is among the wealthiest members of Congress. She also garners the dubious distinction of carrying the lowest public approval rating in Congress. Why does Ms. Pelosi apparently have such low approval ratings? Bloggers, the media, and the American public alike enjoy painting the Speaker with broad and caricatured brushstrokes that depict her as artificial, alien, cut-throat or downright corrupt. Perhaps it's because of the saber-tooth tigress power thinly veiled beneath her assumed grandmotherly exterior. Perhaps it is because of her continued insistence that the liberal agenda is the only acceptable legislation. She either tables or votes against so much of the Republican and even Blue Dog legislation that there is no room for compromise or discussion. She is not one to turn the other cheek to criticism, but, according to one Time writer, has quipped, in retort to negative Republican remarks, ""If people are ripping your face off, you have to rip their face off." Pelosi demonstrates not only boundless determination in barnstorming her liberal causes, but in separating supporters from perceived enemies. 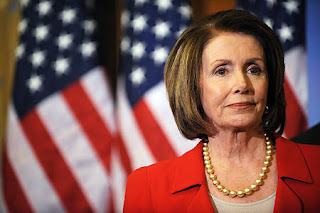 Should any politician urge caution or piecemeal agreement, that politician can quickly become an accomplice to the enemy in Ms. Pelosi's field of vision. Many Americans believe Pelosi is out-of-touch with middle class American needs and concerns. She has been perceived as having more interest in wielding White House clout than in anything else. She has taken heat from the Catholic church and other Pro-Lifers with her assertion that one way to improve state finances is through population control: Pelosi explained in a January 2009 interview with ABC's George Stephanopoulos ",,,[C]ontraception, will reduce costs to the states and to the federal government," and, "Family planning services reduce cost... No apologies." Not only was the recent health care reform bill extremely unpopular with at least half of the American population, but the second measure, a "reconciliation act" package added to the bill days later, could potentially undo up to 40% of the theoretical savings by postponing cost-covering taxes until 2018, possibly longer. The health care reform also contains language which many legislators, including Pro-Life Democrats, felt at odds with because it would loosen current regulations regarding federal funding for abortions. Her voting record is black and white, with an unflinchingly consistent pro-choice slant. She received a rating of 100% from NARAL Pro-Choice America and a 0% rating from the National Right to Life Committee. She has voted against every measure that the NRLC felt to be important in protecting life in the womb. While she wants a moratorium on the death penalty, she also wants to expand human embryonic stem cell research. And while she wants to enforce harsher punishments on those who commit hate crimes against gays, she doesn't want it to be considered a federal crime if a fetus is harmed during another crime. She believes health care should be a right for every American, but gun ownership should not. Pelosi presents a dark dichotomy, while her words and demeanor insist she supports human rights, she only seeks to uphold certain rights according to her agenda. It will be interesting to see what happens during the summer campaign season as America struggles to decide which direction to take next. Please continue to pray for national and local leaders, that God would lead and direct them regardless of which side of the aisle they stand on.